Access to microgravity environment can be obtained via different means, including ground-based, aircraft, suborbital and orbital providing different duration of microgravity. Short duration of microgravity can be achieved on Earth by dropping objects from tall structures. Longer duration of microgravity can be obtained via airplanes, sounding rockets, spacecraft and space station. 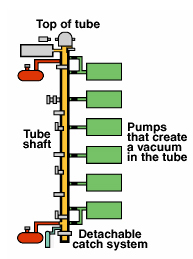 A drop tower or drop shaft is a long, vertical conduit within which experiment packages are being dropped and subjected to microgravity during free fall. 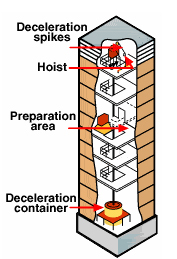 Drop towers (above ground) and drop shafts (below ground) provide microgravity qualities of 10-4 g for a relatively short duration between 2.2 to 10 seconds. (See figures below) The key facalities are as follows. NASA Glenn Research Center in Cleveland, Ohio has a drop tower of 24 meters tall and a drop shaft 132 meters deep, providing 2.2 and 5.2 seconds of microgravity respectively. NASA Marshall Space Flight Center in Huntsville, AL, has a 105 meter drop tower providing 4.6 seconds. ZARM in Bremen, Germany, acheives 4.7 seconds with its 110 m drop tower. Drop towers and shafts are used for experiments that only need a short duration of microgravity, or for an initial validation for experiments that will be carried out in longer duration of microgravity.